Christianity became the dominant religion of the Roman Empire at the beginning of the fourth century, at about the same time the Roman Empire was divided into two separate but equal units: the Western Empire, with Rome as its administrative centre, and the Eastern Empire, with the ancient Greek city of Byzantium (later renamed Constantinople) as its capital and administrative centre. Difference between the Eastern and Western Empires: Rome moved to backwater status in the fourth and fifth centuries. Milan supplanted Rome and then Ravenna became the third and final capital of the Western Roman Empire. This was necessitated due to the fact that the Emperor of the West was required at first to be close to the frontier dealing with the Barbarian invasions (i.e. Milan) and then in the fifth century to seek a stronger defence position in Ravenna. ​The head of the Church in the East was next to the head of the Empire in Constantinople. But in the West, the head of the Church, the Bishop of Rome, never moved from Rome, even though the Western Emperor was later in residence in Milan and then in Ravenna. So Rome never lost its religious centricity. This in turn led to the development of the Papal estates following the collapse of the Western Empire itself under the weight of repeated and persistent attacks. The Eastern Empire, by contrast, thrived. Constantinople assumed Rome's leading role in culture and art. Under its culture aegis, the peoples of the Hellenistic world and beyond became Christianized. Christian lands in the East included Greece, the Balkans, the Crimea and lands on the shores of the Black Sea, Asia Minor (today's Turkey), Palestine and Syria, Egypt and the Libyan coast, and the ancient land of Ethiopia, south of Egypt. The Eastern Church was divided for religious administrative purposes. Each division was ruled by a Patriarch, equal in status, with the Patriarch of Rome considered simply as "primus inter pares" ("a first among equals"). From the seventh century onward, many of these lands fell under Arabic rule, though Christians continued to live as a minority in these regions. Byzantium itself, however, continued to thrive and to convert new peoples in the north: the Slavs of the Balkans and Eastern Europe, who had arrived as invaders in the seventh century; the Bulgars, who settled in the area where Bulgaria is today; and the people of Ukraine and Russia, which included the Vikings, who had colonized the length of the Volga River and its Adjacent lands. Constantinople remained the artistic, cultural and spiritual centre of all Orthodox Christians, even as they came under Islamic occupation. When, on May 29, 1453, Constantinople itself fell to the advancing armies of the Ottoman Turks, the Byzantine Empire came to an end. The Eastern Roman Empire had finally fallen after having continued the traditions of ancient Greece and Rome throughout more than a thousand years of shining cultural and artistic creation. 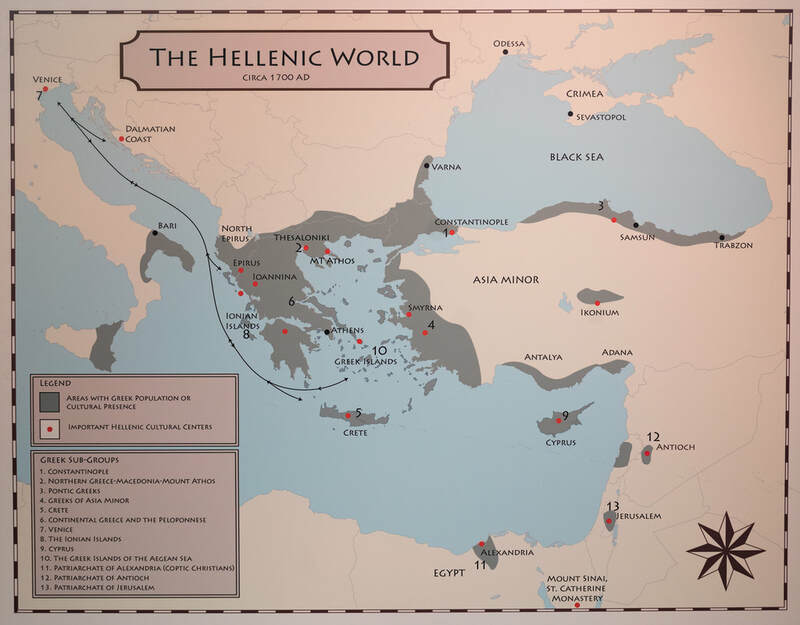 Map of the Hellenic World, panel in the Tilakos Collection Exhibition, June 22 - October 21, 2018, Museum of Russian Icons (MRI), Clinton, MA. 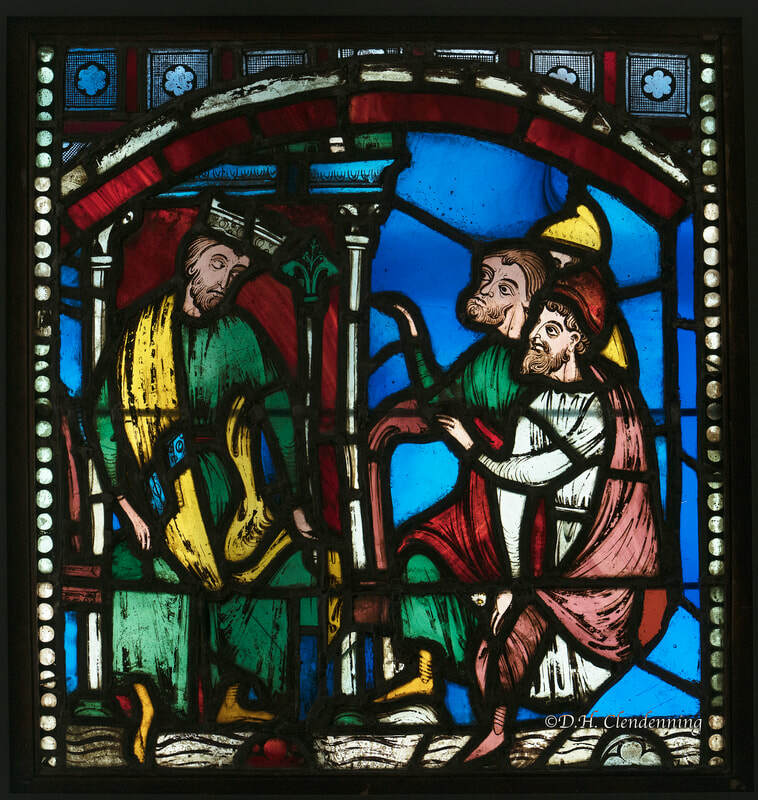 Messengers from Ephesus before Emperor Theodosius, c. 1200-1220, France (Worcester Arts Museum, MA). Map of Byzantine Empire from "Byzantine Philanthropy and Social Welfare, D. Constantelos, Rutgers University Press, 1968.
iconography: the visual images and symbols used in a work of art or the study or interpretation of these: the conventional iconography of Christian art. The term comes from the Greek word ikon meaning image. 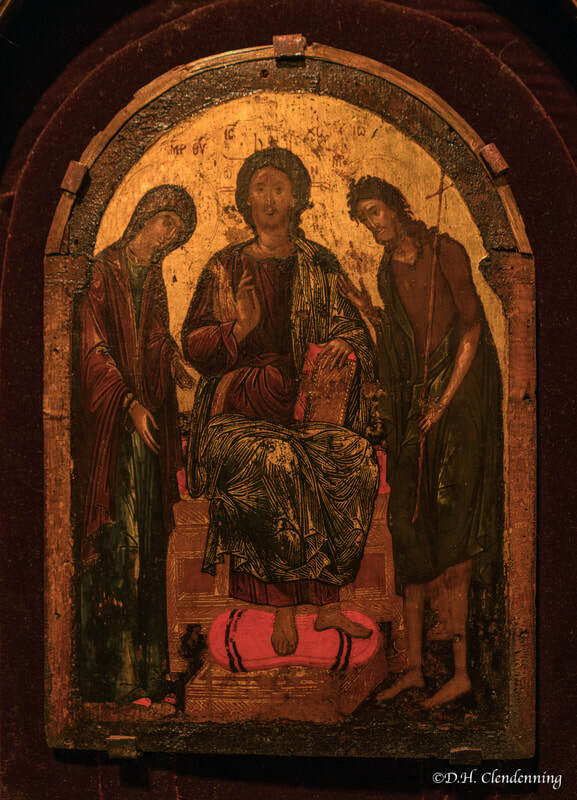 An icon was originally a picture of Christ on a panel used as an object of devotion in the Eastern Orthodox Church from at least the seventh century on. Hence the term icon has come to be attached to any object or image that is outstanding or has a special meaning attached to it. 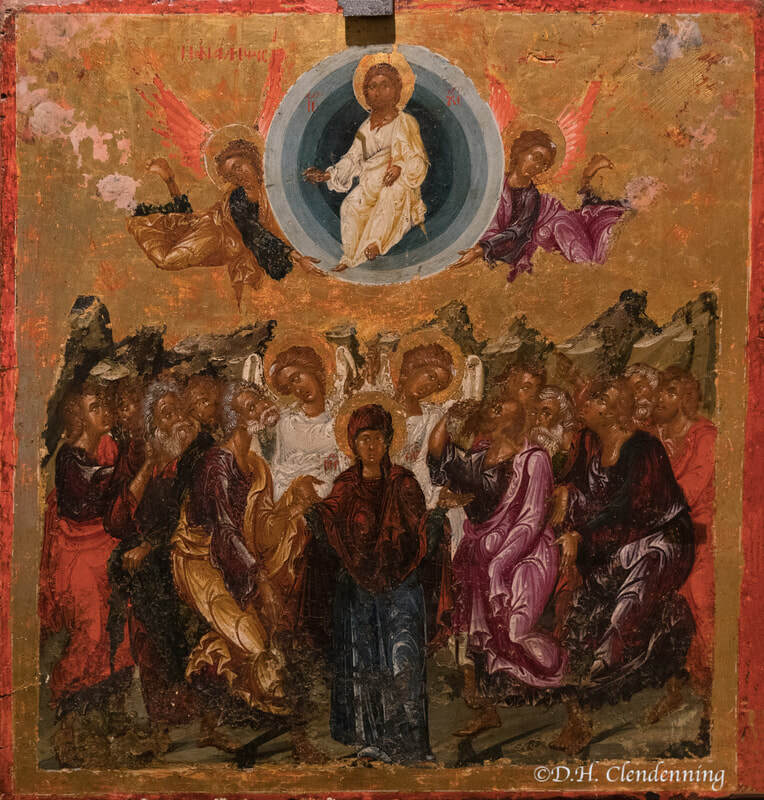 Icons are most commonly created with tempera paint on wood panels but they can be made using a variety of materials such as metal casting, mosaics, textile works, and frescos. 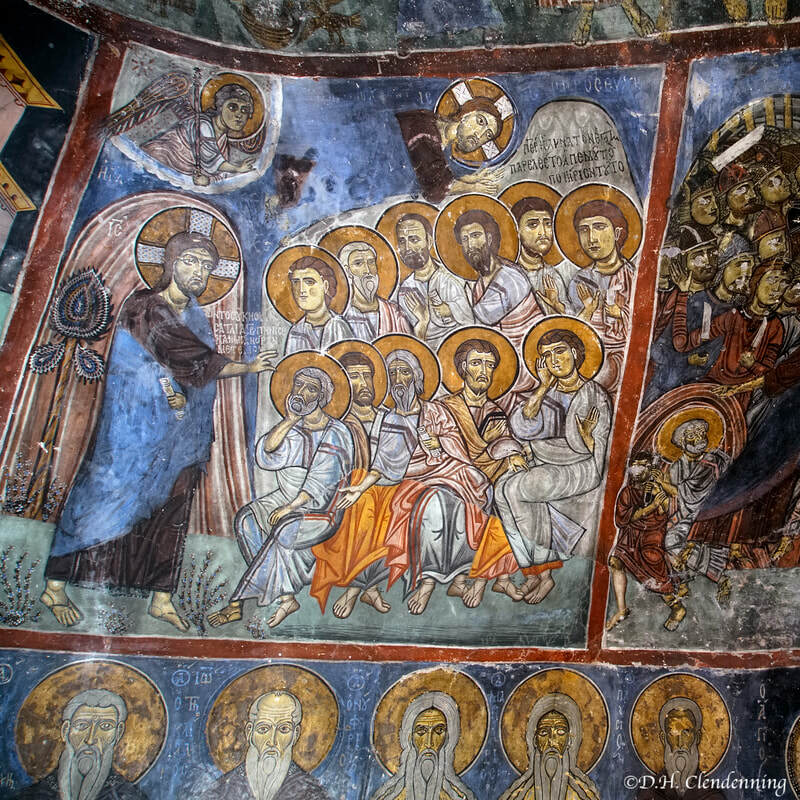 The oldest icons date from the 5th and 6th centuries; and after suffering a temporary setback as a result of the iconoclastic movement they played an increasingly important role throughout the history of Byzantine art, reaching their apogee at the time of the Empire's final collapse. ​The icon is an archaeological record and a work of art. The Orthodox Church understands the icon to be a sacred image depicting a higher, divine reality. It is a visible reflection of an invisible realm in which all these qualities are simultaneously present. For the past two thousand years the icon has remained a constant image of the eternal and divine. ​An icon as a sacred image depends on the continuous and accurate replication based on a prototype. The icon painter copies from the prototype as accurately as the medieval scribe and illuminator made the exquisite copies of the Bible. Just as the faithful would not alter the core meaning of a sacred text, such as the Bible, the same hold true of the icon. ​Over time, regional differences and cultural influence allowed for stylistic changes in the icons, each becoming its own distinct work of art while remaining surprisingly constant in its purpose. The icon, no matter the artistic influence, links the viewer directly to the dawn of Christianity when many of the early practitioners were illiterate and relied on visual information to understand the World. ​In order to understand the language of the icon the viewer must desire to meet with this reality: to enter into it, the viewer needs to learn to read the icon. The icon must not be regarded as a simple illustration of the Gospels or other theological texts. Visual form and Word are fused together to penetrate an alternate reality. ​An iconography is a particular range or system of types of image used by an artist or artists to convey particular meanings. For example in Christian religious painting there is an iconography of images such as the lamb which represents Christ, or the dove which represents the Holy Spirit. In the iconography of classical myth however, the presence of a dove would suggest that any woman also present would be the goddess Aphrodite or Venus, so the meanings of particular images can depend on context. The production of these small images, painted on wooden panels in an egg-yolk medium, was promoted after the 13th century by a whole series of circumstances. In the first place the practice grew up of hanging at least two rows of icons on the iconostasis (screen bearing icons, separating the sanctuary of many Eastern churches from the nave), considerably increasing the number required; the larger icons in the lower tier represented Christ, or the Virgin and Child, or the patron saint of the church, while on the upper tier were icons of the liturgical festivals, the Deisis or scenes from the lives of saints. A second factor was that in time of disturbance or danger to the Faith - as a result, for example, of the victories of the infidels - one of the ways in which ordinary people could seek reassurance and express their confidence and hope was to have in their homes images of Christ, the Virgin or the various saints to which they could address their prayers more easily and more frequently than in church. Gradually, therefore, each family came to have their own icons, varying inequality and costliness according to their resources. Theses icons now provide his historian with a mass of evidence, enabling him to observe the long continuance of traditional forms. ​The icon-painters were not much given to innovation: they sought to reassure the faithful that the image would preserve its efficacy and power, and the best way of achieving this was to maintain the traditional patterns which were familiar to all. As time went on, however, other influences came into play alongside this conservative trend. In Eastern Christendom, where much of the population had fallen under the Turkish yoke while other areas remained independent, there was not the same cohesion aa before 1453, nor the same close links with the capital. In Crete, and later even more strongly in the Ionian Island, which still belonged to Venice, Italian influences were powerfully felt. In Russian and elsewhere artist expressed their religious ideal in forms which were no longer wholly Byzantine. Iconography (or iconology) is also the academic discipline of the study of images in art and their meanings. The Engleistra (Place of Seclusion) of Agios Neofytos Monastery, 12th century. 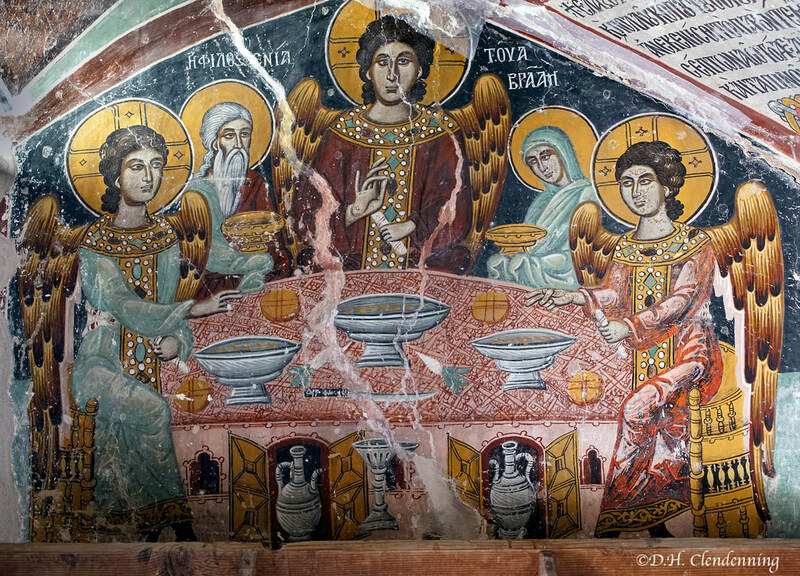 The paintings follow traditional Byzantine church decoration and were completed after 1197. 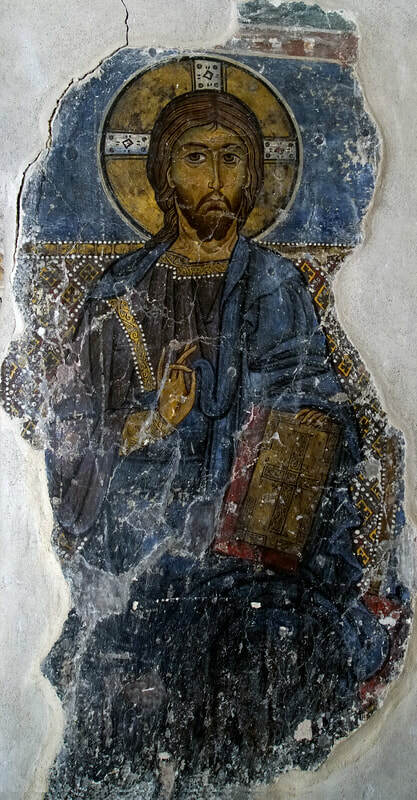 Title: Byzantine wall painting of Jesus Christ, c.1183. Order No. : A1-0071. Location: The Engleistra, Agios Neofytos Monastery. Title: Byzantine wall painting: Isaac Comnenus, Commenid Dynasty (Byzantine Emperor of Cyprus), c.1184 - 1195. Location: The Engleistra, Agios Neofytos Monastery, Cyprus. Christ with his Disciples, Byzantine wall painting, c.1240. Order No. : A1-9993. Location: Engleistra of Agios Neophytos, Cyprus. The Blessing. 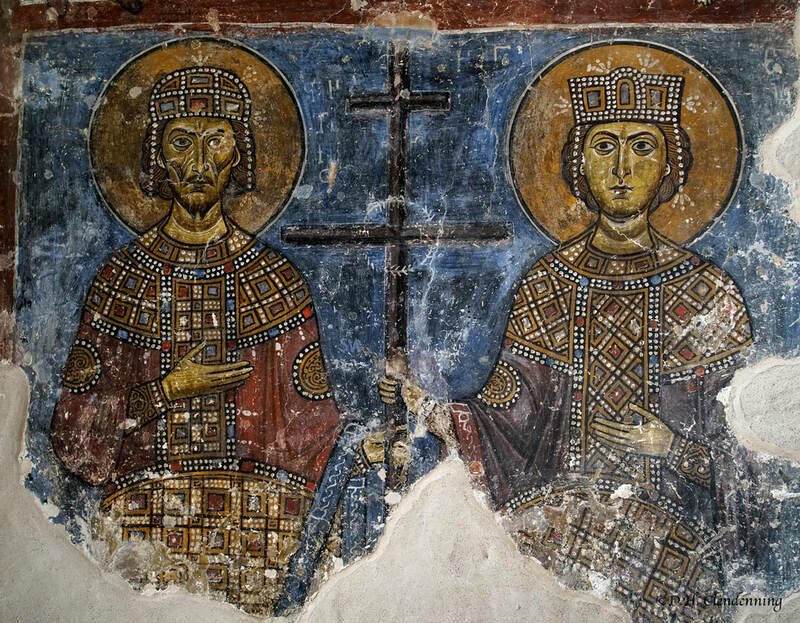 Byzantine wall paining, c.1240. Order No. : A1-0055. Location: The Engleistra, Agios Neofytos Monastery, Cyprus. 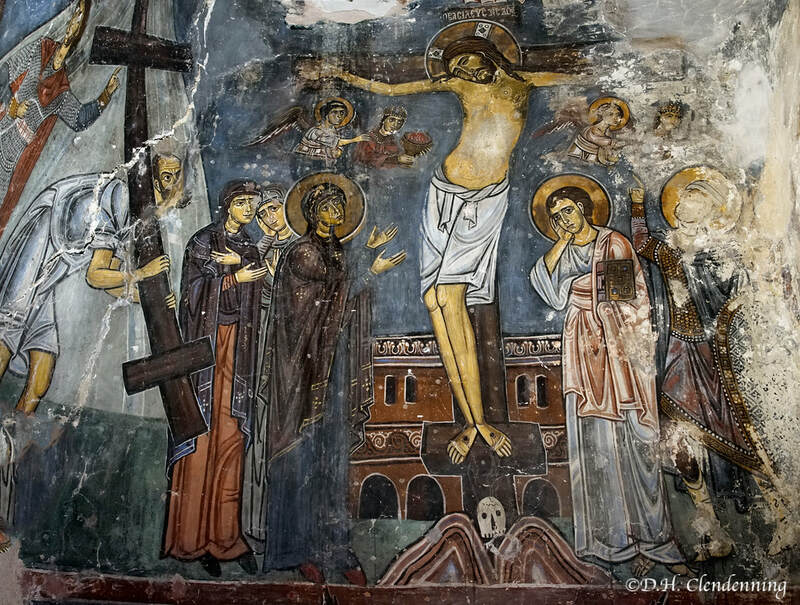 Title: The Crucifixion, nave of the Engleistra. c.1214 Order No. : A1-0058. Location: Agios Neophytos. 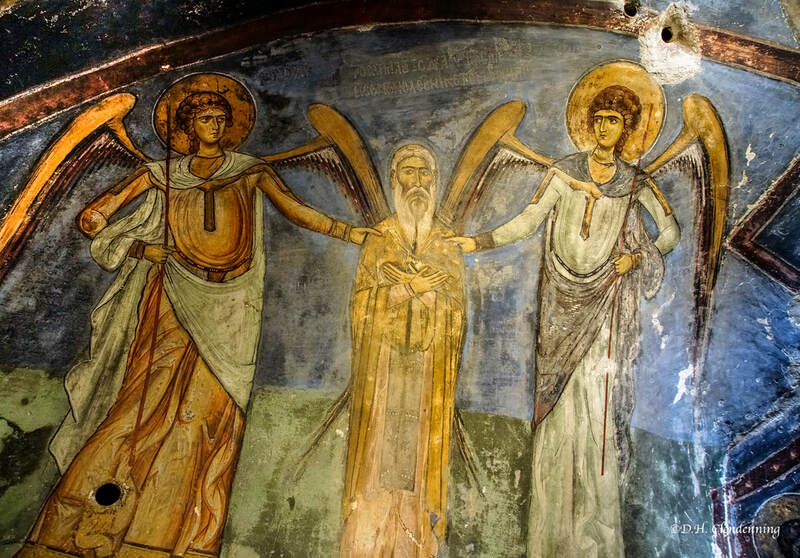 Title: Saint Neophytos in prayer between archangels Michael and Gabriel. The Bema of the Engleistra, c. 1183. Order No. : A100093. Location: Agios Neophytos, Cyprus. Title: Christ - in the Byzantium style. Order No. : A1-1291 Location: Boston Fine Art Musuem. Icons illustrate the links and continuity of Greek art and culture from Late Antiquity, through Byzantium, to the present. 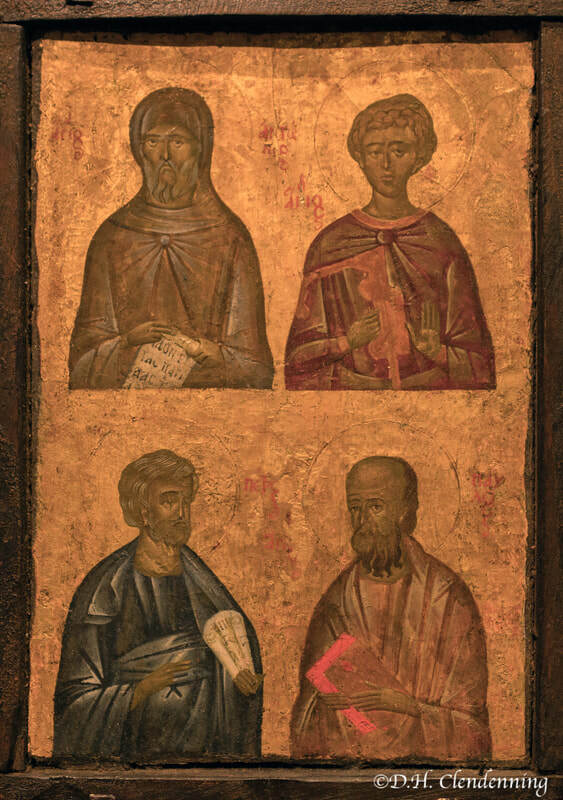 Title: Four Chosen Byzantine Saints, 14th century Order No. : A1-8364. Location: Byzantine (The Tiliakos Collection, USA). Four Chosen Byzantine Saints: At the top Saint Anthony the Great, George the Great Martyr and in the lower register Peter on the left and Paul on the right. 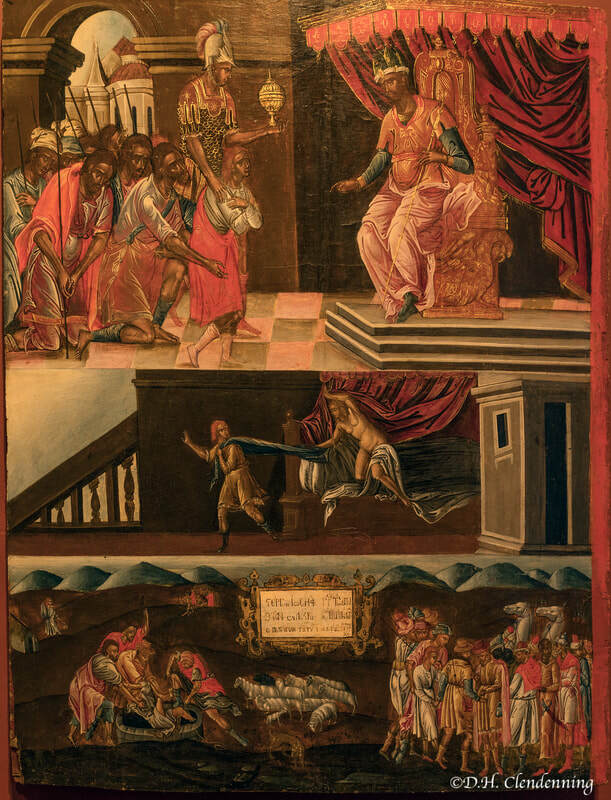 The icon maintains its entirely Byzantine character and material nature, and the idiom that the painter uses bears limited resemblance of the characteristic of the Cretan School. 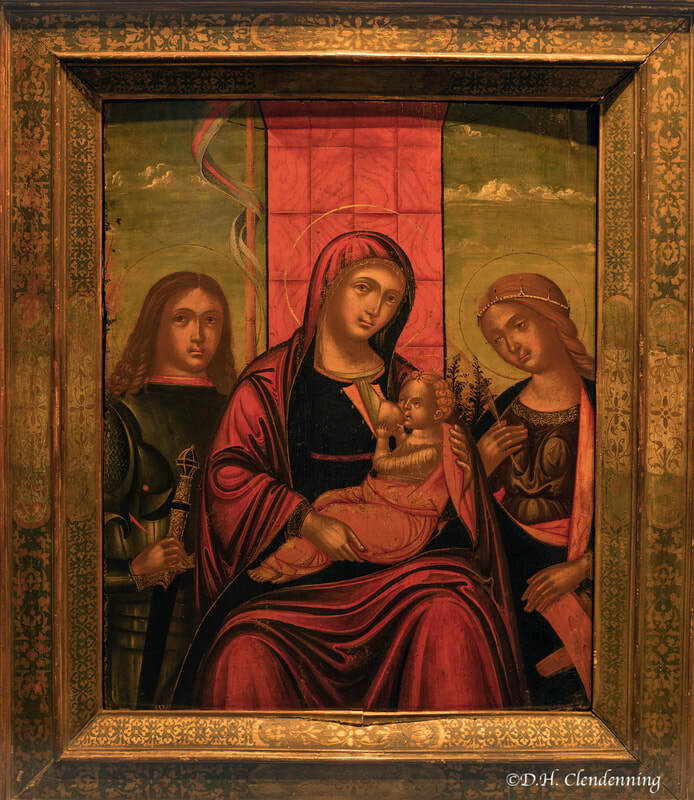 Title: The Virgin and Child Enthroned Triptych, Byzantine, Late 14th Century. Order No. : A1-8339. Location: Constantinople (Tiliakos Collection). The Virgin is seated on an Imperial carved wood throne with a wood plinth as support for her feet. Both furnishing are decorated with extensive gilt details, and she sits on a large red silk elongated pillow. The angels are dressed in the attire of attendants in the Imperial palace who carry Imperial authority as well. They are guard and servants at the same time. The iconography in entirely Byzantine. It is an icon subject matter without the intrusion of later western influences, but also, this iconography transforms into the subject known as "Virgin Mary Queen of Heavens". The small triptych, 6 5/8" x 8 3/4", was made for personal adoration and as an object to be carried on one's body for protection and prayer. 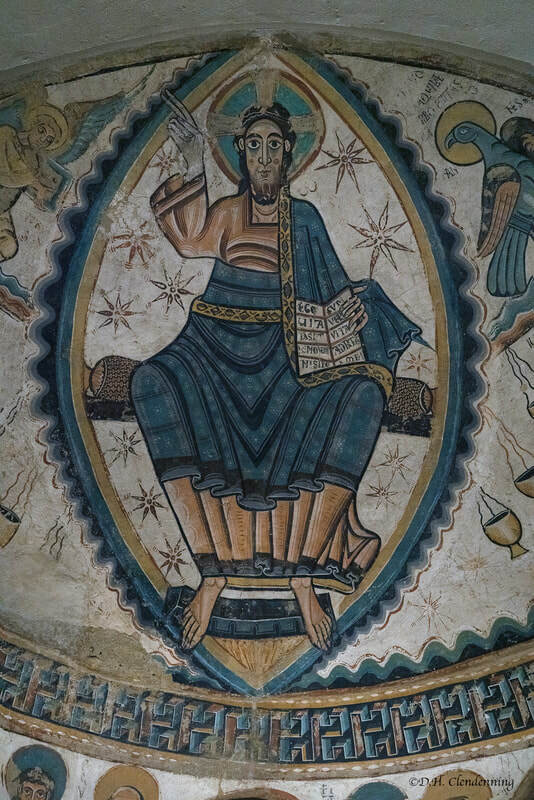 Title: Christ Pantokrator, Late 15th Century, Mount Athos. Order No. : A1-8365. Location: Northern Greece (The Tiliakos Collection, USA). A male-only holy retreat, Mount Athos is located on a peninsula in northern Greece that is the spiritual heart of the Eastern Orthodox Church. The monastery holds on to to the traditions of Byzantium when the might of the Byzantine Empire meant Greek culture dominated the eastern Mediterranean. ​There have been monks on Mount Athos since the sixth century, with monasteries still ruling the Julian calendar, 13 days behind the more common Gregorian calendar. Doing he day the monks work -- gardening, cooking, painting icons -- until is it time for vespers before sunset. 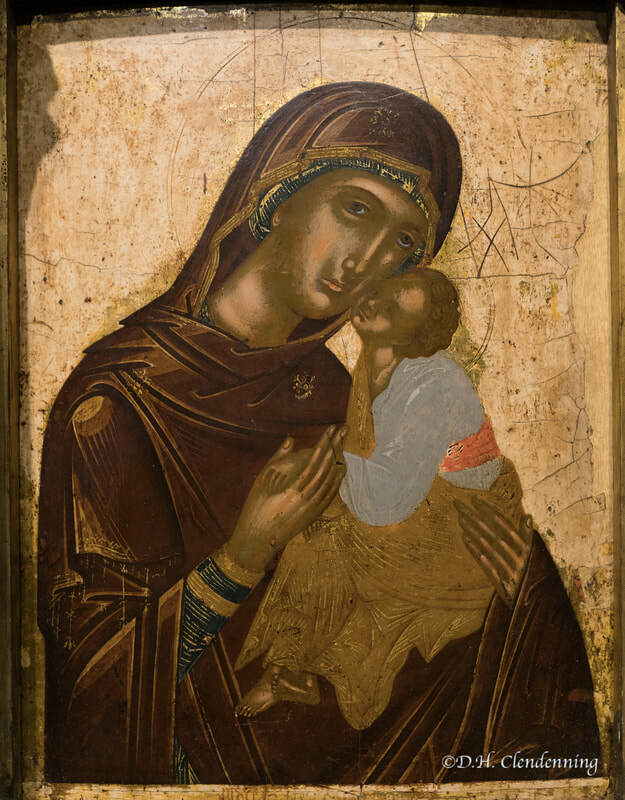 Title: The Virgin Glykophilousa (Mother of God holds her son), Late Byzantine. Order No. : A1-8338. Location: Crete (Tiliakos Collection). Title: The Virgin Lactans (The Virgin Mary nursing the infant Christ), 15th century. Order No. : A1-8333. Location Crete or Venice (Tiliakos Collection). 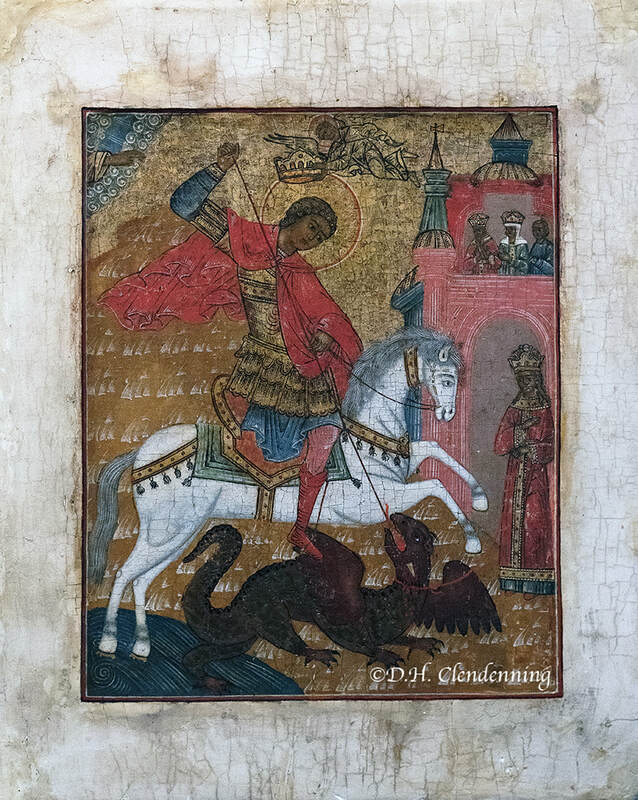 Title: The Miracle of Saint George, Russian, 15th Century. Order No. : A1-6476. Location: Nationalmuseum, Stockholm, Sweden. The Nationalmuseum, Stockholm has an outstanding collection of Russian and some Byzantine icons. Icons are the sacred images of the Orthodox Church. They have their own long-standing visual symbolism which differs radically from that of Western art. Their two-dimensionality, stylization and abstract qualities have provided important sources of inspiration from artist throughout the 20th century up until today. Title: Scenes from the Life of Joseph. Late 16th century. Order No: A1-8331. Location: Venice (The Tiliakos Collection). 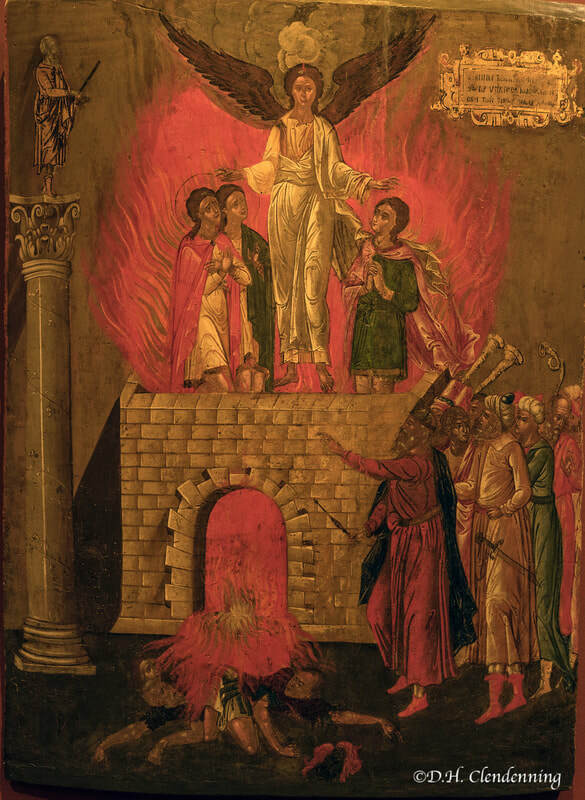 Title: The Three Youths in the Fiery Furnace, Late 16th century. Order No. : A1-8330. Location: Veneto-Cretan (Tilakos Collection). Title: Greek Icon. Palm Bearer - feast days, 16th century. Order No. : A1-9481. Location: Agios Neofytos Monestary Museum. Title: The Assumption, 16th century. Order No. : A1-9487. Location:Agios Neofytos Monestary, Cyprus. 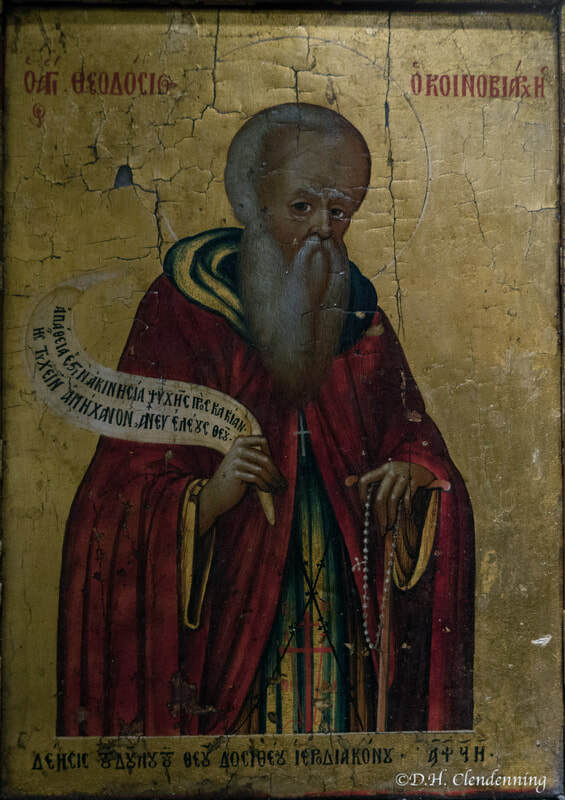 Title: Saint Spyridon, 17th century. Order No. : A1-800. Location: Ionian Islands (The Tiliakos Collection). The Ascension of Christ, Early 17th Century. Order No. : A1-8334. Location: Crete (The Tiliakos Collection). Title: Saint Theodosios, Coenobium leader, c1798. Order No. : A1-9455. Location: Agios Neofytos Monastery. 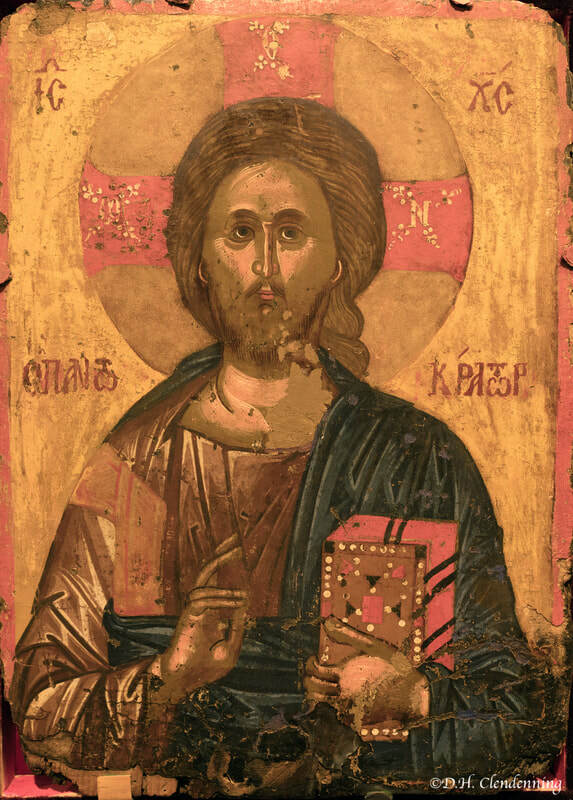 Title: Jesus Christ Image, Greet Icon, 18th C. Order No. : A1-9516. Location: Agios Neofytos Monastery Museum. Title: The Three Hierarchs, Greek Icon, 1856. Order No. : A1-9516. Location: Agios Neofytos Monastery Museum. 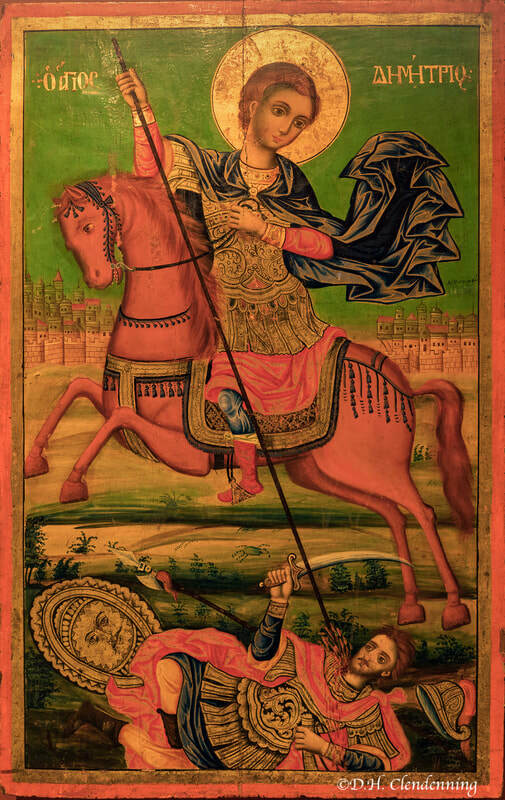 Title: The Great Martyr Demetrios of Thessaloniki, c. 1830-1850. Order No. : A1-8342. Location: Mount Athos, (Tiliakos Collection). Title: Icons on Pulpit, Greek Orthodox Church. Order No. : A1-9435. Location: Cyprus. Russian Art on its Byzantine roots. Russian icons are typically paintings on wood, often small, though some in churches and monasteries may be much larger. The use and making of icons entered Kievan Rus' following its conversion to Orthodox Christianity in AD 988. As a general rule, these icons strictly followed models and formulas hallowed by Byzantine art, led from the capital in Constantinople. As time passed, the Russians widened the vocabulary of types and styles far beyond anything found elsewhere in the Orthodox world. Russian Icons were an important aspect of medieval religious life in eastern Europe. Many of these beautiful sacred "images" are now considered to rank with Europe's great pictorial masterpieces. "Stemming from the ancient Egyptian tomb portraits, it was in Russia, converted to Christianity only at the end of the tenth century, that this art became of paramount importance. Russian painters soon became inspired by icons to produce their finest pictorial works, and to create a school of painting which has rarely been surpassed in depth of religious feeling." A series of reprographics of Russian icons following traditional stylization. 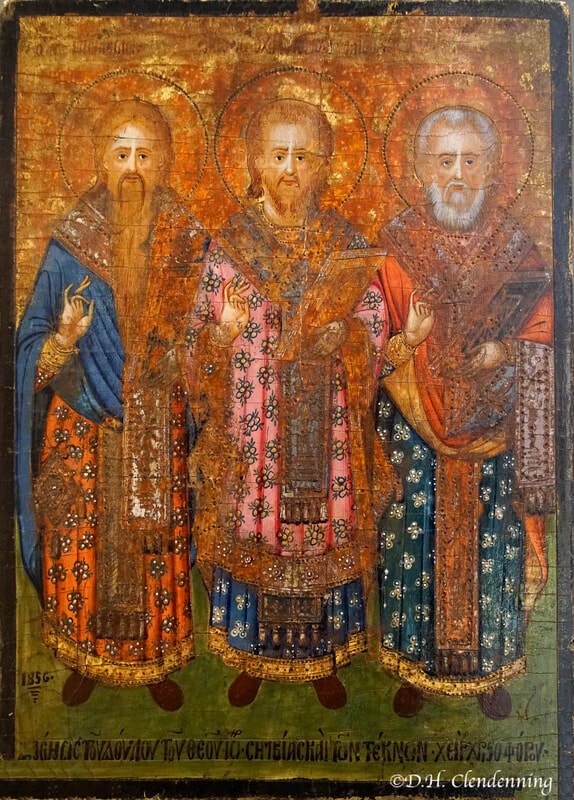 Title: 'Old Testament Trinity', c.1400, Russian Church. Order No. : A1-0912. Title: Christ and his Disciples, c.1600. Order No. : A1-0975. Title: Entry into Jerusalem, c.1820, Palekh. Order No. : A1-1035. Title: Elijah, c.1700. Order No. : A1-1085. The legend of St. George and the Dragon tells of a terrible dragon that demanded human offerings from the town of Selene as its price for not laying waste to the town. The day the King's daughter is to be sacrificed, St. George comes riding by. On condition that the town's heathen inhabitants convert to Christianity, he slays the dragon. 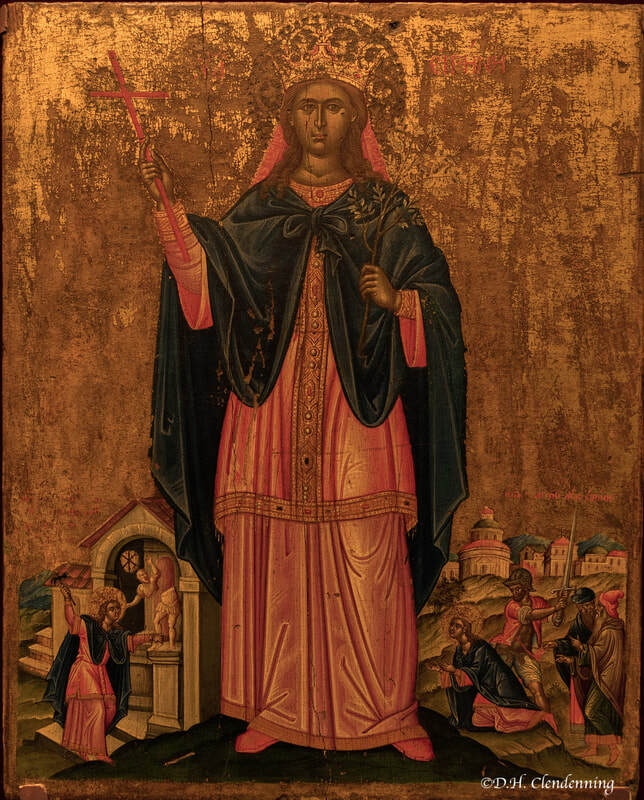 Title: Saint Paraskeva, Russian, c.1600. Order No. : A1-8395. Location: Russian (MRC Collection). Saint Paraskeva was born in Rome of devout Christian parents in the year 140 A.D. At that time, there were less than fifty thousand Christian in the world. With her strong faith she persuaded many people to forsake their pagan idols and commit themselves to her faith in Jesus Christ. She continued her missionary endeavours despite being persecuted by the Roman emperors Antonius and Marcus Aurelius. She was finally put to death as a martyr to her faith. In her high hand, she hold a cross, sign of her martyrdom. In her left hand, she holds a scroll inscribed in Old Church Slavonic. In Greek, Paraskeva is the word for Friday. With Friday being the traditional market day, Saint Paraskeva is venerated as Patron of the marketplace and commerce. This panel was most likely a church icon, probably from the local tier of an iconostasis in a rural church. Title: Royal Doors of an Iconostasis, c.1600, Vologda. Order No. : A1-0966. There is a rich history and elaborate religious symbolism associated with icons. In Russian churches, the nave is typically separated from the sanctuary by an iconostasis, or icon-screen, a wall of icons with double doors in the centre. 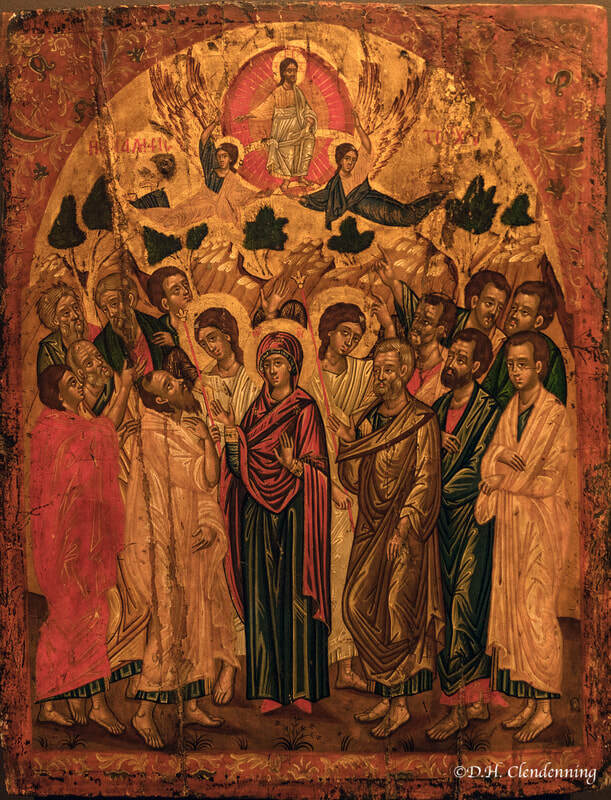 Icons are considered to be the Gospel in paint, and therefore careful attention is paid to ensure that the Gospel is faithfully and accurately conveyed. Old Russian icons are often slightly concave due to the natural warpage of the wood - sign of originality. 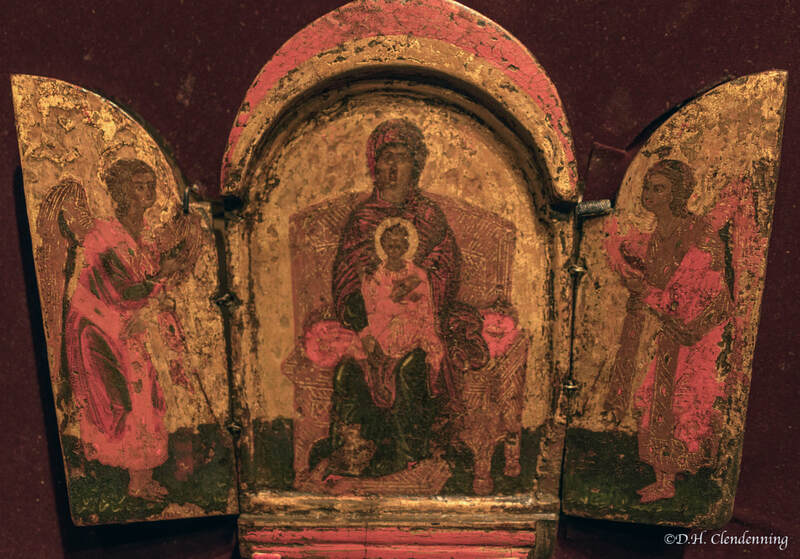 All photos are of original icons from a private Russian Icon Collection in North America. St. Anne's Anglican Church National Historic Site of Canada, Toronto. 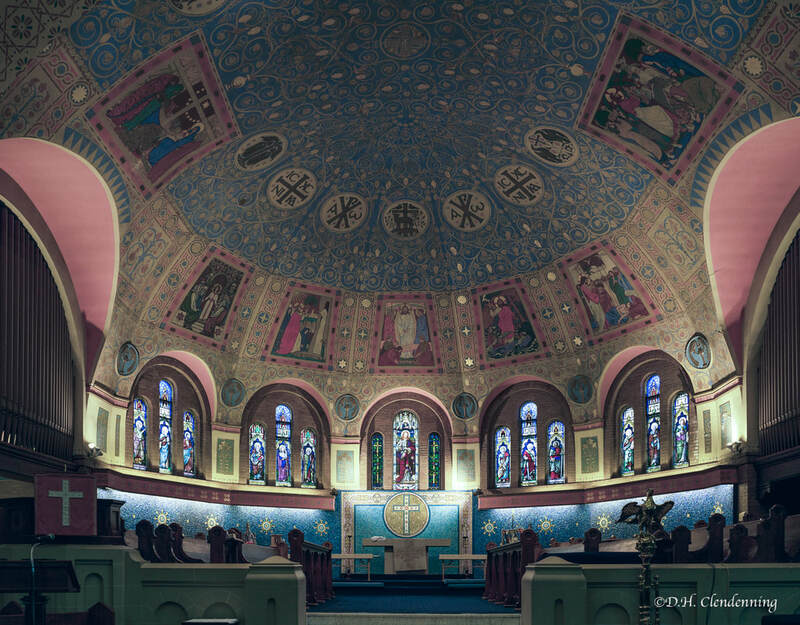 Built in 1907-1908 in the Byzantine Revival style the church contains a remarkable cycle of paintings by ten prominent Canadian Artists, including three (J.E.H. MacDonald, Fred Varley and Frank Carmichael) from the famous Group of Seven. The result was their only religious art. The elaborate interior mural decoration, designed by J. E.H. MacDonald, cover the walls and ceiling of the apse, the main arches, the pendentives and the central dome. The cycle combines narrative scenes, written texts, as well as decorative plasterwork and detailing accentuating the architectural lines of the building. Official recognition refers to the building and its interior decorative work on its legal lot. Its cycle of painting belongs to the revival of mural decoration that emerged int he last quarter of the 19th century and is a manifestation of the Arts and Crafts movement which sought to ally architecture with the sister arts of painting and sculpture. 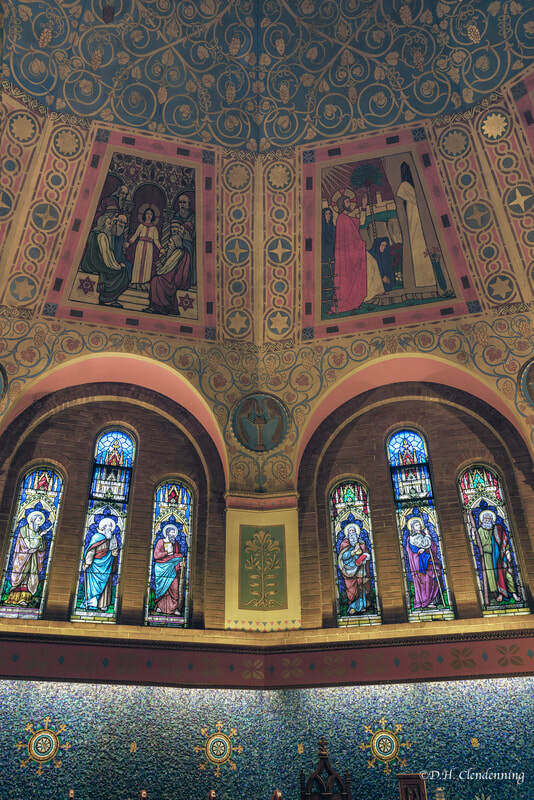 St. Anne's decorative cycle draws upon the motifs, colours and the artistic conventions of Byzantine art while adapting their character to reflect a contemporary Canaidan setting. The works are integral to the church's architectural style. The original decision to build in a Byzantine style reflected the support for an ecumenical movement that advocated unification with other Protestant denominations. Architect W. Ford Howland's design was intended to evoke the early Byzantine period, before the Christain church had split into its subsequent numerous denominations. 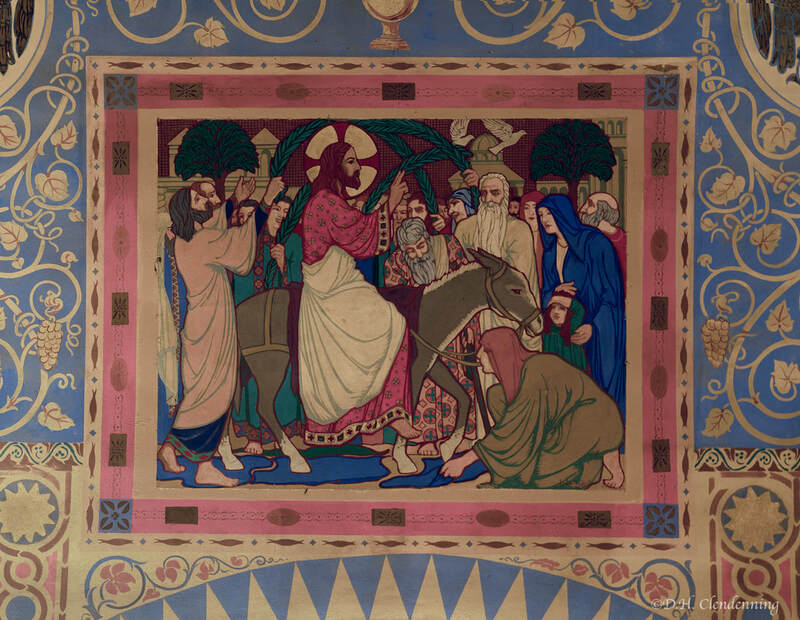 Title: Elaborate Interior Mural Decoration on apse or chancel ceiling, Byzantine Revival style, 1923. Order No. : A1-9098. Location: St. Anne's Church, Toronto, (1907-08, Ford Howland, architect). ​The apse or chancel ceiling has a background of blue over which is a vine leaf pattern with clusters of grapes in gold leaf. On the ceiling are circular decorations including symbols such as the Three of Life guarded by the two cherubim, and the Lamb. The alpha (A) and the Omega (W) signify Christ as the beginning and the end. Also present are the letters I and C, which are the first and last letters of Jesus in Greek, and C and R, which are the initials letters of Christ in Greek. These combined with the Greek Word NIKE (conquers) give "Jesus Christ conquers". These are ancient Christain symbols. Between the chancel windows are circular plaster reliefs depicting a peacock and an urn by the sculptors Frances Loring and Florence Wyle. 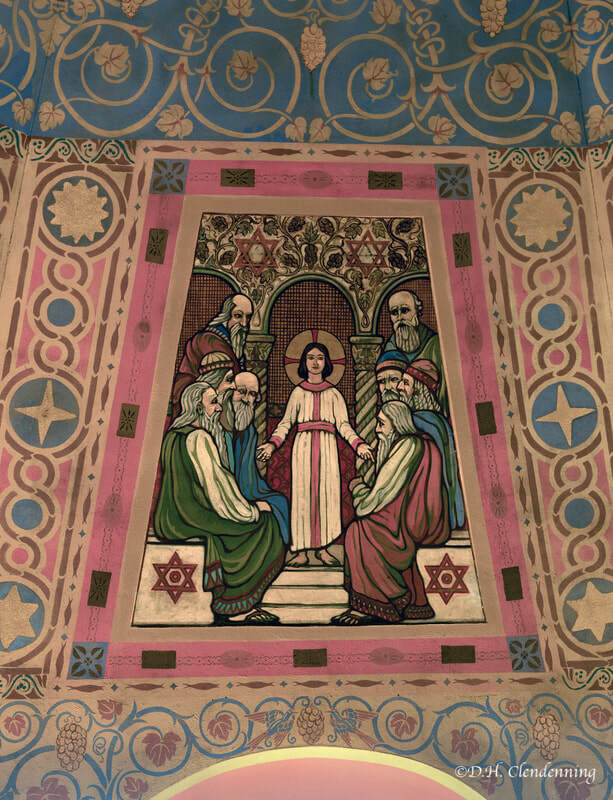 The central mosaic work added in 1960 was the work of Nicholas Kavakonis. 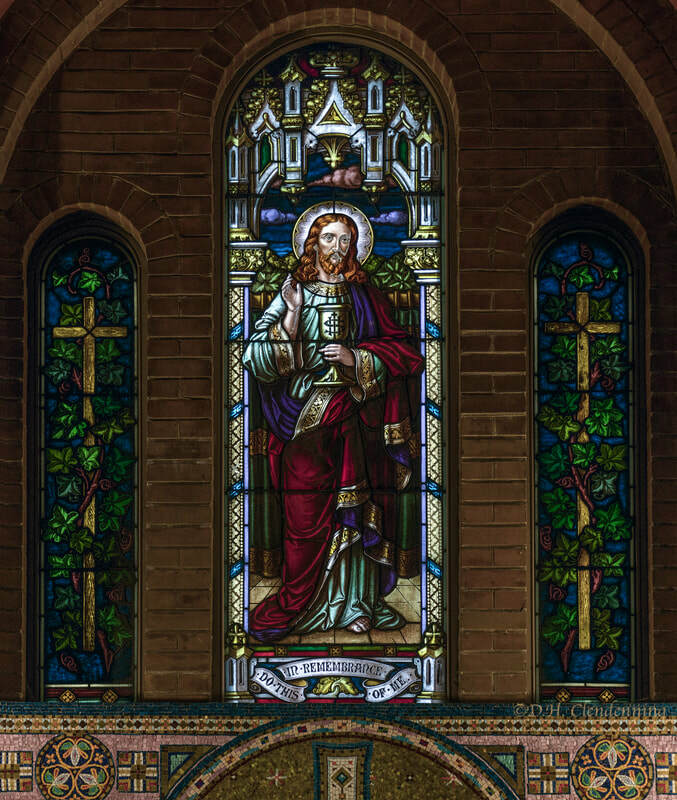 The stained glass windows in the chancel came from the original 1862 church. St. Anne's was designated a National Historic Site in 1997. 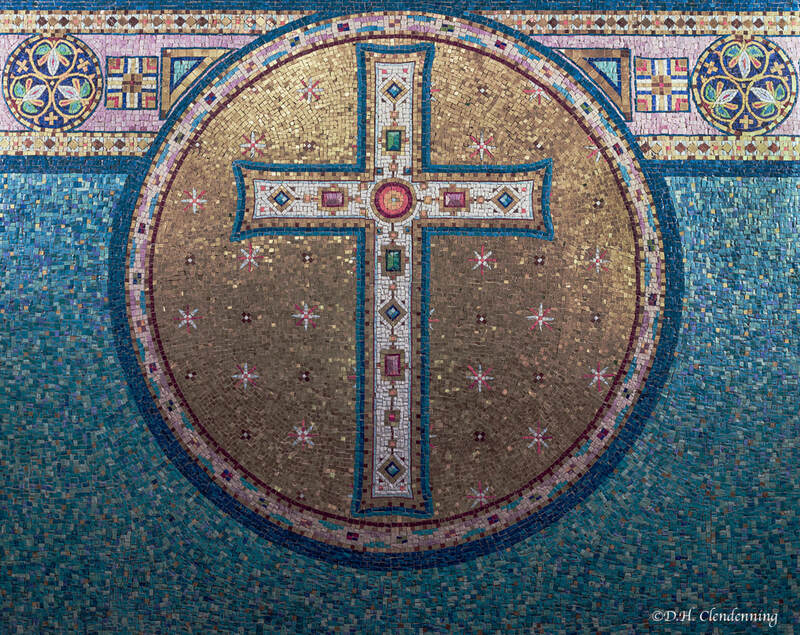 Title: Byzantine Revival style mosaic in chancel behind the alter. Order No. : A1-9113. Location: St. Anne's Church, Toronto. 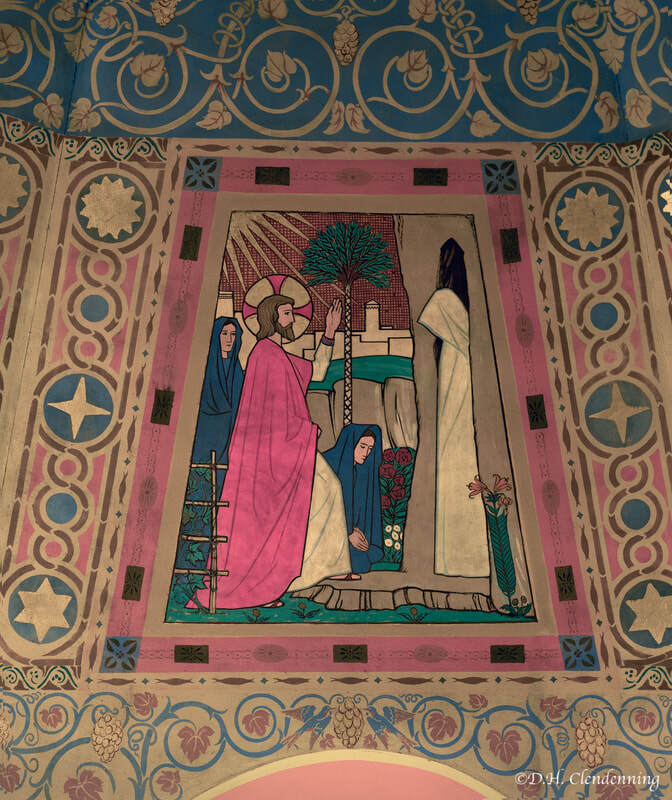 Title: Paintings and Stained Glass Windows in Apse, c.1923. Order No. : A1-9124. Location: St. Anne's Toronto. Title: Jesus in the Temple by Arthur Martin, 1923. Order No. : A1-9128. Location: Aspe painting in St. Anne's Church. Title: The Raising of Lazarus by Thoreau MacDonald, 1923. Order No. : A1-9131. Location: Aspe painting in St. Anne's Church. Title: Image of Jesus. Order No. : A1-9249. Location: St. Anne's Church. The stained glass window, above the wall mosaic, is from the Church of 1862.